With India Nepal Wildlife Tour, our endeavor is to make you visit some of the most famous wildlife sanctuaries in India and Nepal such as Corbett National Park, Suklaphanta National Park, Royal Bardia National Park and , Royal Chitwan National Park. Also included in the itinerary is the visit to some popular tourist places in Nepal such as Pokhara and Kathmandu. Guided tour of Pokhara- Bindhyabasini temple, Purano Bazaar and Radhakrishna Temple. Arrive at the Delhi international airport and drive to the hotel pre-booked for your stay. In the afternoon, embark on a half day sightseeing tour of Shahjahanabad and Lutyen’s Delhi. The attractions you will visit here include India Gate, Jama Masjid, Parliament House, Gandhi memorial, Laxmi Narayan Temple, Qutub Minar Complex and Humayun’s Tomb .Stay overnight in the hotel. In the morning, leave by road for Corbett National Park. Upon arrival, check into the resort for night stay. 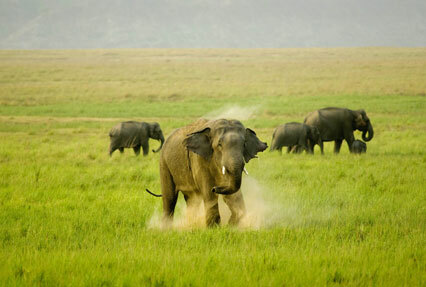 In the afternoon, enjoy game safari in the national park. India’s first recognized national park, Corbett Wildlife Sanctuary is home to an array of wild animals, birds and reptiles. Stay overnight at the resort. For the next two days, you will explore the length and breadth of this wildlife sanctuary twice a day. Enjoy safari in the forested plains of the Corbett National Park and see the beautiful fauna species residing here. Stay overnight at the resort. In the morning, leave by road for Mahendra Nagar, a small town on the border of India and Nepal. From here onwards, our Nepal associate will look after you. Later, leave by road for the Suklaphanta National Park. Upon arrival, check into the camp to relax. The rest of the day is free to relax. Stay overnight in the camp. On the 6th day, enjoy a full day safari tour of the Suklaphanta National Park. The national park has the third largest population of the Great One-horned rhinoceros. Stay overnight at the resort. In the morning, leave by road for Royal Bardia National Park. Upon arrival, check into the resort/lodge to relax. In the afternoon, enjoy game safari at Bardia National Park. Stay overnight at the resort/lodge in Delhi. The next two days are a sheer delight for wildlife enthusiasts. 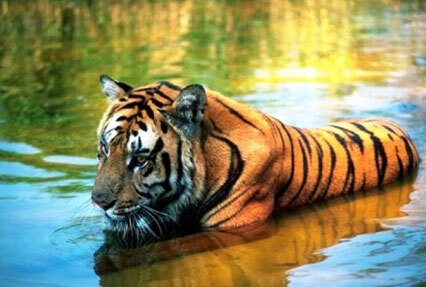 Each day, you will enjoy two game safaris in the Royal Bardia National Park. The park is home to as many as 53 mammals including swamp deer, Royal Bengal Tiger and wild elephant. Stay overnight at the resort in Bardia. Early morning, leave by road for Chitwan. Upon arrival, check into the hotel/resort. Spend the rest of the day at leisure. Stay overnight at the hotel/resort. Established in 1973, Royal Chitwan National Park is emblazoned as a UNESCO World Heritage Site. The upcoming two days will make you feel satisfied and proud of your decision for taking India Nepal Wildlife Tour. 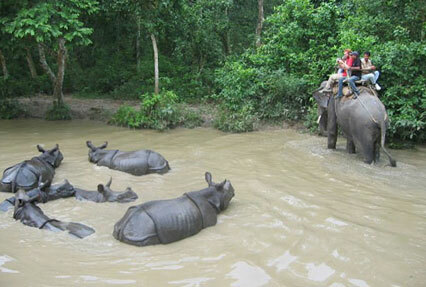 A total of 4 opportunities will come your way to explore the length and breadth of the Chitwan National Park. Post an early morning game safari in the park, leave by road for Pokhara. Upon arrival, check into the hotel. In the afternoon, embark on a half day sightseeing tour of Pokhara covering Bindhyabasini temple, Purano Bazaar and Radhakrishna Temple. In the evening, enjoy a boat ride on the Lake Phewa. Stay overnight in the hotel. In the morning, hit the road to Kathmandu. Upon arrival, check into the hotel to relax. 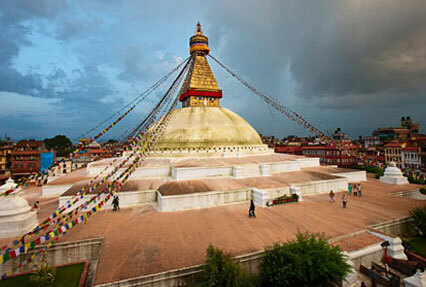 Thereafter, enjoy a half-day sightseeing tour of Kathmandu covering Boudhnath and Pashupatinath temple. Stay overnight in the hotel. In the morning, board the flight to Delhi from Nagpur. Upon arrival, check into the hotel to relax and fresh and up. Later, drive to the international airport to board flight for onward destination.